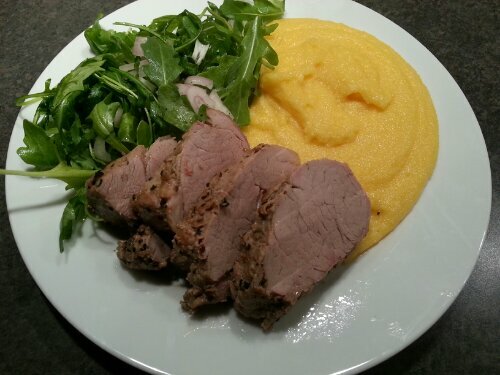 That’s a generous portion of Trader Joe’s pre-marinated peppercorn pork tenderloin aside a parmesean polenta and an arugula salad with shallots and a simple homemade dressing. The TJ’s tenderloin was simple to cook, and turned out to be moist and DELICIOUS! I highly recommend giving it a try. Lucky man, that looks great!